Around 6pm one evening in 2009, Iran shelled across its border into a community of Kurdish shepherds in the mountains of Iraqi Kurdistan. Pieces of shrapnel from a rocket hit a teenager, Sabir, in the neck and shoulder. Sabir survived, and CPT contacted him to hear about his experience. In June of this year CPT contacted Sabir again to learn about Iran's present cross border attacks in his area, and Sabir invited the team to spend the night with his community in the mountains. Traveling to meet Sabir, the team came to a fork in the road and did not know which way to go. They asked some men in a pick-up truck for directions. The men were from Hawler, the capital of Iraqi Kurdistan, and had come to the area to pay the shepherd of the sheep that they owned. While they spoke, the shepherd came down the hill with the men's sheep. The shepherd was Othman, Sabir's cousin. After receiving his pay, Othman left the sheep with his son, and got into the CPT vehicle to show them the way. Soon afterward, Sabir came in his pick-up, and the team followed him up the mountain. Sabir led the team up to the green highlands where the weather was much colder than in the team's home area of Sulaimani. He stopped on a wind-swept plateau where his relatives lived with their tents and animals. After visiting in Sabir's tent, the team followed Sabir farther up the mountain to see where the rockets hit in 2009. Near the top of the mountain was another plateau where Sabir, Othman, and others walked around describing to the team what happened that evening in 2009. On that evening, ten rockets hit the area. Othman showed the team where one rocket hit a home and where one hit his vehicle. Rocks were piled on another place where a rocket hit. The men showed the team pieces of rockets still on the ground. Sabir also showed the team the crater where the rocket that injured him hit. Back in the tent, Sabir told the team that when the shrapnel hit his neck and shoulder he lost consciousness. Friends drove him into town to the public hospital, but the doctors could not perform surgery there. Sabir's family could not afford surgery at the private hospital. So, they had no choice but to drive him to Hawler, arriving at 4am in the morning. The doctors did not start surgery until late in the evening. Family members thought he was dead. Sabir says it is like a miracle that he survived. Several other men in the tent described their losses in 2009 from the Iranian shelling. For example, the shelling killed 20 of Sabir's father's sheep and 14 of his cows, and killed 13 of Othman's cows and damaged his vehicle. Neither Sabir nor anyone else in the area received any compensation from the Kurdistan Regional Government or the Iraqi Central Government for their injuries or losses. In 2011 Iran fired several thousand rockets into the area, killing one person and killing or scaring off an estimated 12,000 sheep. No government group or NGO had visited them regarding the cross border attacks since 2009. The team received gracious hospitality while staying with Sabir and his relatives. The following day the team feasted on a goat killed for the team. That morning the team also heard a rocket flying overhead. Sabir said they hear drones fly over every day. Iran and Turkey claim to target the PJAK and the PKK (resistance groups fighting for the rights of Kurds in Iran and Turkey) with the cross border attacks. The US shares intelligence information with Turkey about these resistance groups, and Turkey shares information with Iran. One of the men in Sabir's community told the team, "We will continue. Every year we sacrifice, but we will continue. This won't break us. Several thousand years this has been our ancestors' land. This is our life. We will never let anyone take our lives... They know there is no PJAK or PKK here. 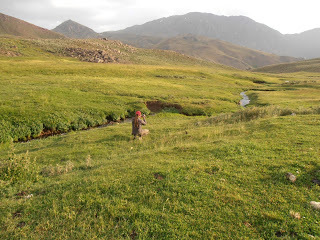 The PJAK and PKK are in Qandil. Last year a woman was killed - she had five children. They, on purpose, want to destroy our life. We will continue coming here." CPT Iraqi Kurdistan does not condone the violence perpetrated by Turkey and Iran against the Kurdish people. CPT Iraqi Kurdistan does not condone the sanctions against Iran emplaced by the U.N, that collectively punish the Iranian and Kurdish People of Iran. CPT Iraqi Kurdistan does not condone the calls for “military action” against Iran.